There are myriad ways that you can pursue overall physical strength and power, and just as many reasons that you might want to. For high performance athletes, building greater power might be about wanting to win a game, crush a match or challenge a world record. For the new mom, greater power might help her reclaim her body after the physical feat of pregnancy and childbirth. Then she might want to use that strength to take on the new demands of motherhood. For the aging office-worker, building greater power could be about maintaining bone density and healthy posture. It might help counter the gravitational pull of a sedentary lifestyle which has been compounded with aches and pains over time. Whatever your reasons for wanting to power up, learning how to generate greater strength will serve you on many levels. Now let’s get down to the essentials and look at three power centers that are great places to start. According the Pavel Tsatsouline, founder of StrongFirst, hailed as the trailblazer that popularized kettlebell workouts in the west, there are three major drivers of power in the physical body: gluteals, grippers and abdominal muscles. Strengthening the gluteals, grippers and abs goes beyond just being able to use these muscle groups to perform their typical actions. It will also help you generate irradiation throughout nearby muscle fibers… thereby boosting overall power. Here are three (plus a bonus!) good strength building exercises for these three power centers. Squatting is hailed as one of the best exercises to build up gluteal strength. But it also demands that the hamstrings, calves, ankles and many more muscles groups join the power party. Plus, squats are considered an ‘anabolic’ exercise–which means they promote overall strength by replenishing muscle cells through the body. We recommend adding a looped resistance band around your thighs to help track your knee position and boost the work in the lateral rotators of your hips. Check out Tune Up Fitness® Teacher Jared Cohen showing us the way. 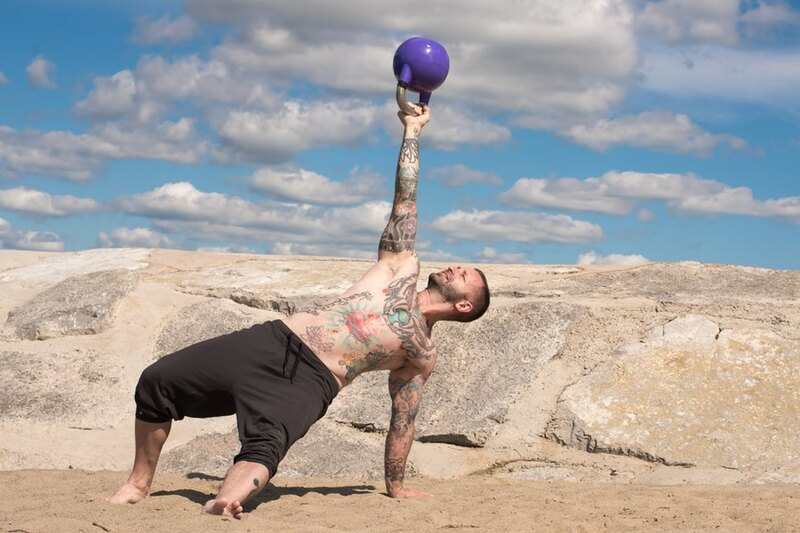 Jared might make this look simple–just walking across a mat with a kettlebell in hand, right? Not really. In order to perform this grip-strengthening feat he needs to engage the flexor muscles of his fingers, but he’s also got to fire up through the forearm, all the way into the shoulders, traps, and even lats. Take about irradiation! Plus, can you see the stability work right down through his core? You better believe that he is engaged through the obliques, even into the stabilizers of the hips. Grab a kettlebell (or a suitcase full of books) and try it for yourself. This exercise will leave no muscle fiber of your anterior core untouched! Here, Yoga Tune Up® creator Jill Miller demonstrates a full frontal abdominal strengthener by first lying on the back, curling up to a half boat pose, then squeezing the knees in for a cannonball. This will light up your rectus abdominis (“6-pack” muscles), obliques and traverse abdominals. But it doesn’t stop there… you’ll also fire the flexors of your neck like the very photogenic sternocleidomastoid, and hips such as the psoas muscle. You didn’t really think we were going to let this post end without highlighting your primary breathing muscle, did you? The bonus exercise we’d like to offer up is Bridge Lifts with the Diaphragm Vacuum. This exercise brings all the focus to your respiratory diaphragm–stretching it, toning it and enhancing your proprioceptive alliance with this main player in your ability to regulate your nervous system. Furthermore, the diaphragm is the downstairs neighbor to the muscle of your heart, and shares continuities of tissue with your psoai–which feed all the way down into your legs. Master this muscle and it will provide not just stronger breath potential, but the ability to regulate the state of your nervous system and harness the power of mindset in the most challenging situations. We hope you’ve gained some inspiration with this simple, three-stop way to think about to improving your overall strength. If you’d like to lend your grippers, gluteals and abdominal muscles more support as they wake up and get to work, check out the program Treat While You Train with Jill Miller and Physical Therapist Kelly Starrett. Layering these muscle-priming self-massage practices into your fitness routine with strength building exercises will make it all deeper, smarter, stronger and sweeter. with some exceptions.. these movements are reflected in activities of everyday life.. very functional! Great examples of each power house exercise and how to strengthening these muscle. Look like I need to add some gripping exercises. Yes! This inspires me even more to start using kettlebells and incorporating more resistance bands into not only squats, but a wide variety of exercises. I tried the half boat to cannonball and definitely feel the fire! All those combined with Uddiyana bandha bridge lifts make for a very strong practice. What about hip thrusters???! Just kidding. Great post, really like all 3 exercises as a way to get people in tune with their glutes, core and grip. All 3 are very important when it comes to creating the necessary tension we need to handle daily life pain free. Also appreciate the bonus. Still need some core release and practice to improve my diaphragm vacuum. These are great exercises because almost everyone can do them! Especially like the banded squat variation – as someone who has always naturally had a strong squat – this helps me to stay engaged! I appreciate this article! It helps to focus time & energy, doing squats with “purpose.” Hopefully, I can find a way to bring these ideas into the regular classes. Loved the resistance bands for the squats, very useful in propriocepting the range for me! I worked with a private client preparing for knee replacement, so squats were out. At 70 she had never done much exercise, but she loved bridges, and gained a surprising amount of strength in the back line of her leg in a short time. We started with some less intense abs, and she came in with a strong grip! The first and third are going to be my top priority to rehab my hip. Thanks! Love this article. These are simple but very effective exercises for the must do areas of your body. I want to incorporate the half boat to cannonball in my warm up for yoga. Irradiation! I didn’t know the word in this context, and it makes so much sense! Nothing in the body works alone, so why not functionally train heavy hitters together? I especially love the kettle bell walk! Ive always loved strengthening my glutes and my abs, but I’ve never thought to strengthen my grippers, this is something I’ll definitely have to build up to, I’m excited to add into my movement practices.